Two men are on the run this morning following a double stabbing in Sheffield after a crash. South Yorkshire Police said two men, aged 21 and 25, were attacked after the Volkswagen Golf they were travelling in was involved in a collision with a Mazda on Burncross Road, Chapeltown, at around 7.35pm. Following the crash on the roundabout close to Tesco Express two men in the Mazda knifed the two men in the Golf and then fled. They have not yet been arrested. Their victims were taken to hospital for treatment, with their injuries described as ‘minor’. In a statement, South Yorkshire Police said: “Detectives are investigating following a stabbing in Chapeltown in which two men were injured. “At around 7.35pm last night, emergency services received reports of a collision between two cars, a Mazda and a Golf, on Burncross Road at the Lound Side roundabout. “Two men inside the Mazda are then said to have assaulted the occupants of the Golf, two men aged 21 and 25, before leaving the area. 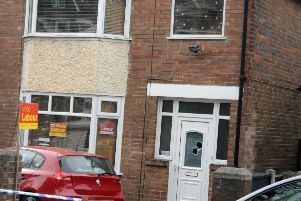 “Both men were taken to hospital where they were treated for minor stab wounds.